The building in which we worship was raised in 1871. 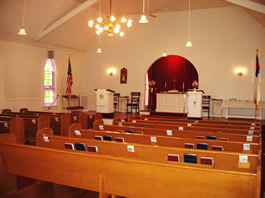 The sanctuary, with its divided chancel and center isle, seats approximately 100 persons. 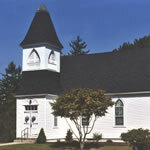 With its warm and simple old New England ambiance, it is the perfect size and setting for a small wedding. A schedule of fees for the use of the sanctuary and/or the downstairs Vestry (which seats 50 comfortably) and kitchen for a reception or other gathering is available by contacting the pastor. See also weddings and funerals.